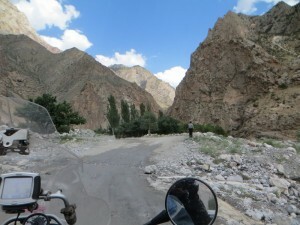 After the deserts of Kazakhstan and Uzbekistan we were looking forward to the mountains of Tajikistan’s Pamir region. We had our official government permit to enter the autonomous region even though the main road was cut by a landslide. Crossing the border we were knocked out by the friendly locals. At our first petrol station the owner was disappointed when we couldn’t accept his offer of a watermelon. The owner of the first hotel we stopped at presented us with the ceramic plate and jug as a ‘welcome’ present. Heading for the capital, Dushanbe we were surprised at the shocking road conditions. 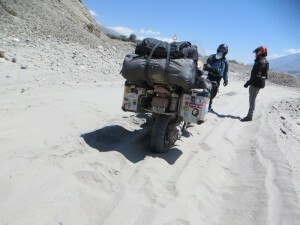 Potholes, gravel and sand made it slow going as we scrambled through mountain passes – it was just a sign of things to come. 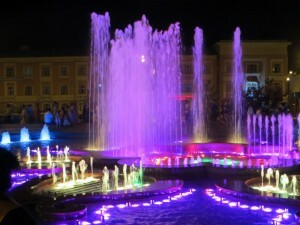 The capital is a friendly, modern city with a dancing fountain accompanied by classical music outside the ballet theatre and plenty of good eateries. Like the Moscow Café where the staff welcomed their non-Russian speaking guests with open arms. 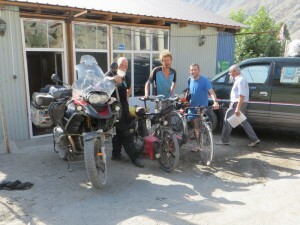 We met up with Canadians Bill and Michael who were also on their way to ride the Pamir. The days on the road were long and hot and slow going. Narrow tracks with rocky sections, sandy sections and water crossings took us alongside the raging river as we made our way down to the Wakhan Valley, overlooking Afghanistan. 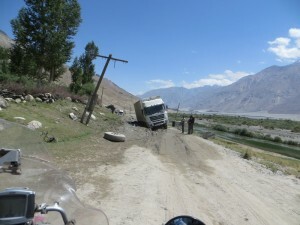 Because of the landslides the trucks were forced down onto this narrow road too, causing major damage to the track and creating traffic jams as trucks backed up, unable to go forward or back. 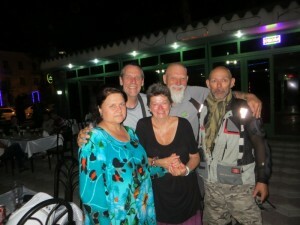 We just kept plugging along, meeting other travellers along the way, like these cyclists who were on their way to China. And they think we’re crazy! Some accommodation was very basic but the guesthouses were welcome havens at the end of a long, difficult day on the road. 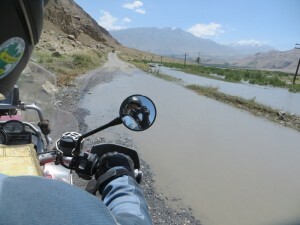 We rode from Dushanbe to Kailikhum, to Khorug, down the track to Ishkashim and then made the run for the other end of the valley…and this is where it all went wrong. The road deteriorated even more with huge sandy tracts. The first one saw the bike standing independently while we prepared to push it out. The next sandy tract saw us take a dive with a very soft landing. The road starts to climb out of the valley just past Langar. 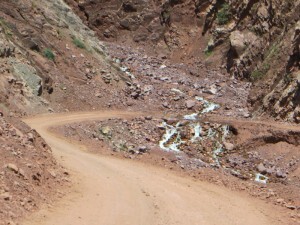 Here we took a hard tumble on a steep, tight curve with an unstable, rocky surface. Brian reinjured his previously torn calf muscle and Shirley lost heart. 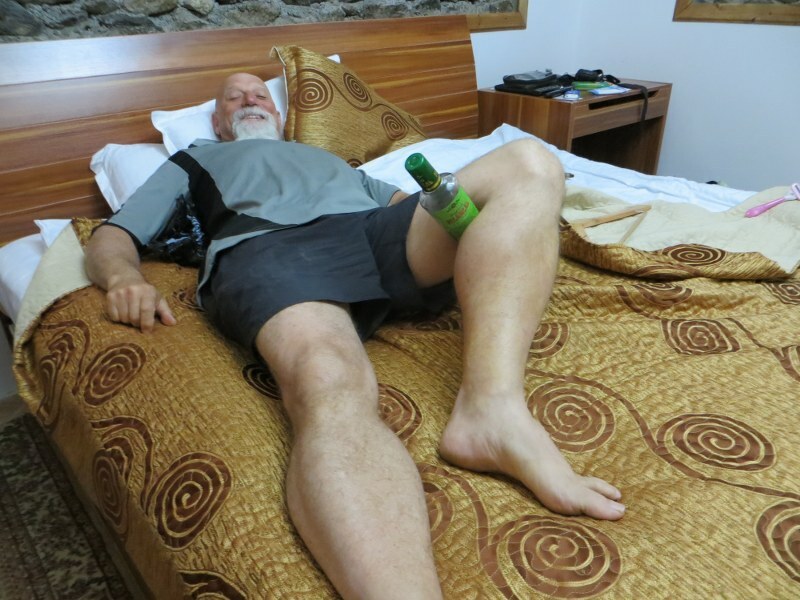 We decided to turn back and spent two days at Khorug in Hotel Lal resting before taking on the mountain passes as we made our way back to Dushanbe. The Pamir was the first road to defeat us in all of our travels, but discretion is the better part of valour. We enjoyed the mountains and the raging rivers. Brian got to throw a rock into Afghanistan without causing an international incident and we lived to tell the tale without major injury or damage to the bike. 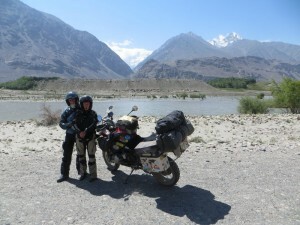 There were plenty of broken bikes and broken bodies at the end of the Pamir. Now we head in Kyrgyzstan on our way back to Russia. 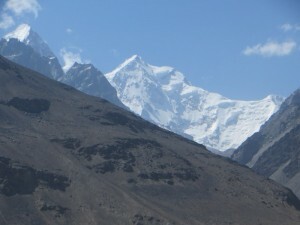 We were wondering how you guys made out on the Pamir going two up when all four of us struggled so much only one up. Smart choice to turn back to Khorg. Michael busted his shield and likely cracked a rib or two and he really suffered holding onto the bars in the wind. I have huge hard bulges on the inside of both calves from getting caught under my panniers in the sand so many times. One of the toughest stretches of road. Ave ever seen as well. I returned to Canada last night and the bike should arrive tomorrow. BTW, mikes GS was stolen from a campsite in Poland, terrible end to a. Challenging trip. Good luck in your further travels!